Thank you all for your prayers and concern for Elijah. He did not had a fever all day today. 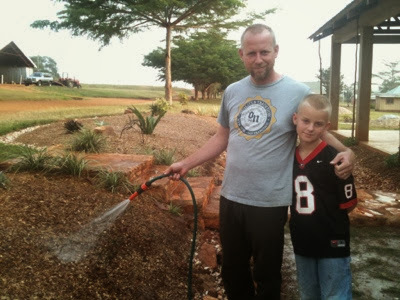 He was still not feeling 100%, but he was been able to participate in school today, go for a bit of a walk and do some watering at our school garden. The photo above is of David and Elijah working together this afternoon. I thought that he was improving, but then later in the afternoon the fever came back, and it was higher than before. He has also continued with a headache and feeling a bit sick to his stomach all day, and those symptoms have worsened also. After discussing and praying about pros and cons, we decided to go ahead and treat him for malaria. Our neighbor in our duplex along with several other members of our team have had malaria the past couple of weeks. So there are mosquitos carrying it around. The doctor thought that was the most likely diagnosis yesterday, but said we could wait and see if he improves. I was really hoping that he had improved, but this evening he was clearly not feeling well. It may be an atypical version of malaria since he is on a malaria prophylaxis. While it has been sad to have my boy not feeling well, I am thankful to know of the many people who are lifting him up in prayer. We are all in God's hands and we don't know what tomorrow will bring. I am asking that it will bring healing for my son. God has given me so much love for him. It is amazing to remember that God has called us his sons and daughters. This morning as I was reading the book of Mark I read the account of Jesus' baptism. God said aloud, "This is my Son, whom I love. With him I am well pleased." (Mark 1:11) God's Word also tells us that those who trust in Jesus have "become the righteousness of God." (2 Corinthians 5:21) As much as I love my son, Elijah, God's love for me and for him is so much greater. He looks at us, His children, with love and pleasure! We have been given the righteousness of God! As I hug my boy I often remind him, and myself, that God loves him even more than I do!